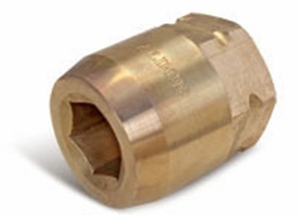 Aldon 4024-252 Bronze Socket Inserts For Never Slip Holders Hex: 2-1/8"
Use hand wrench only. Limit torque (non-impacting) to 500 ft/lbs. Service life of bronze socket inserts is indeterminate: it is based on torque applied and frequency of use. Because bronze is a soft metal it is spark-resistant, but has a shorter service life than steel. Product Reviews for Aldon 4024-252 Bronze Socket Inserts For Never Slip Holders Hex: 2-1/8"